A recent 2018 report on Tencent's Internet Detection Disorders has revealed that over 17 million people in China have visual disturbances. In terms of online entertainment, the report shows that 95 percent of users with visual impairments use cell phones to access the Internet. Of these, approximately 90% of people with visual impairment choose smartphones with the Huawei brand, Apple and Xiaomi. The report also suggests that users with visual impairment are in higher demand for knowledge content, and the inappropriate and mainstream operation is that when accessing information on their phones occurs. Today, most smartphones are equipped with "Blind Mode" like VoiceOver on iOS for iPhones and TalkBack for Android phones. Both features allow texts to be read by sound, which makes it easier and easier for people with visual impairment to use smartphones. Based on ongoing efforts in this area, the United Nations Educational, Scientific and Cultural Organization (UNESCO) has undertaken Xiaomi's efforts to ensure that all people with disabilities have the ability to use technology in the same way as other people, and to Fully integrates into society. The UN agency did this in one official post on Weibo. This post also has an official Weibo account of Xiaomi, where Lee Jun has been hanged. 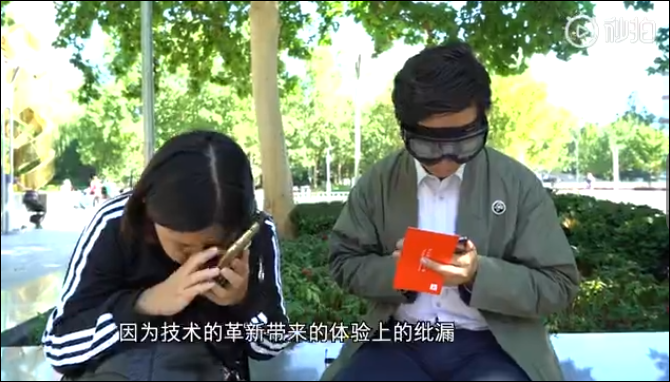 This post also contains a video showing how people with visual impairment can use Xiaomi smartphones. 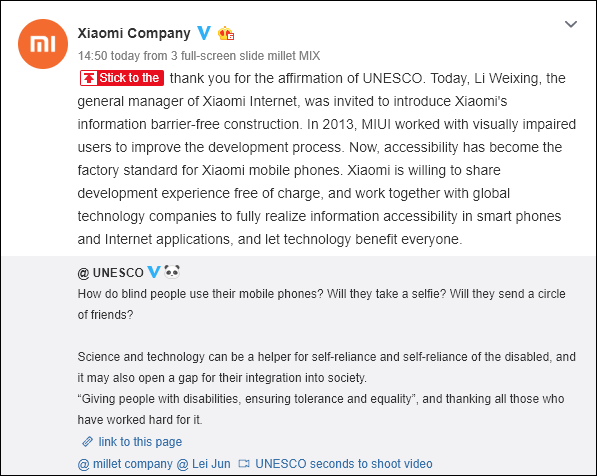 Lee Jun, CEO of Xiaomi, quickly acknowledged UNESCO. His answer is: "Thanks to the UN diagnosis of Xiaomi's work. We always want to connect with all users and we continue to invest in access to information, in fact, for all the people of the world, we can enjoy the beautiful life with the use of technology. "